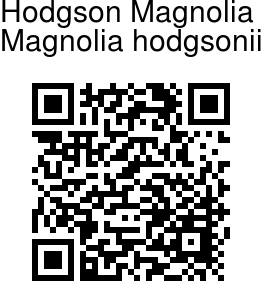 Hodgson Magnolia is a small evergreen tree up to 15 m tall. It is named for Bryan Houghton Hodgson, 19th century British amateur naturalist in Nepal. The leaves are obovate-oblong, 20-50 cm long and 10-13 cm broad, with a leathery texture. The flowers are fragrant, with nine tepals up to 9 cm long, the inner tepals white, the outer ones greenish. The fruit is 13-15 cm long, composed of an aggregate of 40-80 follicles. The wood is very soft and not normally useful. 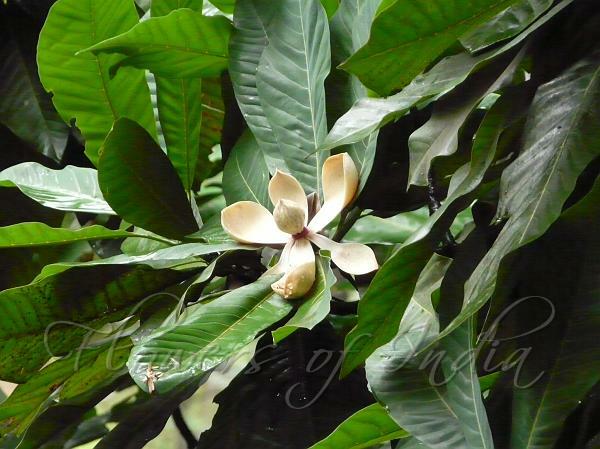 Like almost all Himalayan Magnolias, Hodgson Magnolia flourishes in a stiff clay soil. It is found in S Xizang, SE Yunnan, Bhutan, NE India, N Myanmar, Nepal and Thailand, at altitudes of 800-1500 m. Flowering: April-May. Identification credit: Nidhan Singh Photographed in Assam.